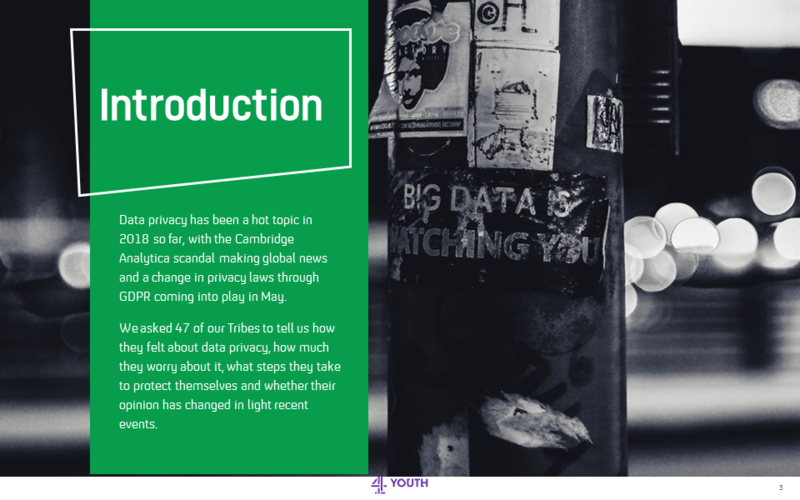 Data privacy has been a hot topic in 2018 so far, with the Cambridge Analytica scandal making global news and a change in privacy laws through GDPR coming into play in May. 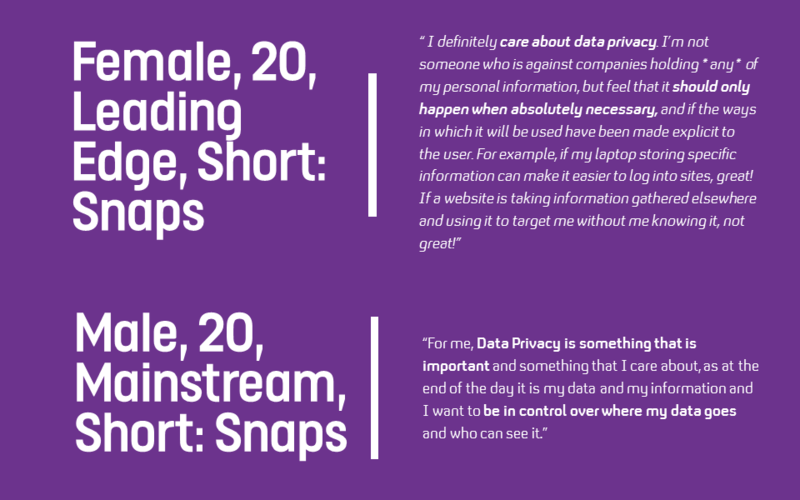 We asked 47 of our Tribes to tell us how they felt about data privacy, how much they worry about it, what steps they take to protect themselves and whether their opinion has changed in light recent events. The vast majority of the community said data privacy was something they are concerned about, they believe that although it’s unavoidable for their information to be collected, it’s information about them, so it should belong to them. This is not to say they believe it’s all bad for companies to have their data, they understand it can be beneficial to them if it’s used in what they see as ‘the right way’. Of the 11% who say they aren’t concerned about data privacy, they say they would prefer if their information stayed private, but they understand they are getting something in return – e.g. free use of social media platforms – and are happy for this exchange to take place. #1 Police what they post –The vast majority of the community said that along with the company who is taking their data, they have a responsibility to make sure they are not posting too much personal information. They try to limit the types of information, pictures and videos they post on social media sites, and only give their data to sites they trust. #2 Update their passwords & privacy settings – Whether they worried about data privacy or not, the vast majority of the community try and control their data as best they can. The majority mentioned they regularly change their passwords, set their social media accounts to the highest privacy settings, and will only friend/follow people they know. #3 Use privacy software – Several members of the community said they proactively try to avoid giving their data away the best they can.They use incognito mode browsers so their browsing history isn’t saved, use specific services that explicitly state they won’t use personal data, use ad blockers and unsubscribe/remove themselves to as many newsletters or databases as they can. Tribes understand that companies will hold some data on them, and they are not totally against it. They want to give as little information away as possible, and only data that will improve their experience as a user (e.g. 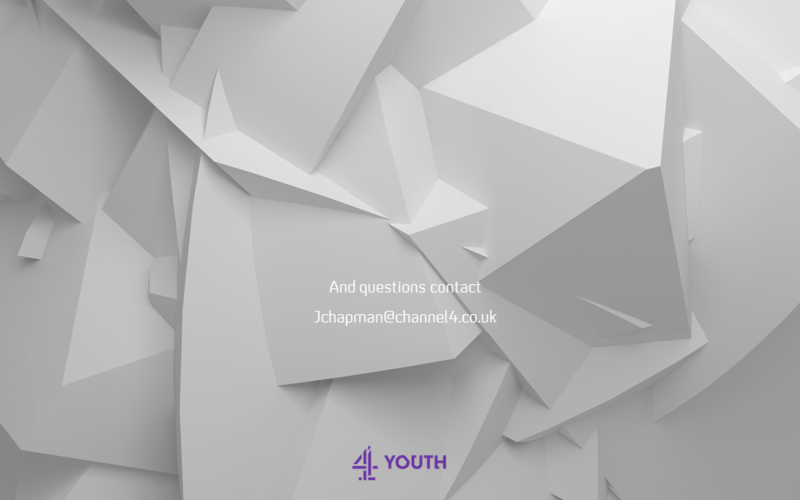 saving their password , delivery address, & in some cases information for personalised adverts). They also only want to give their information to brands and services they know and trust, and will actively avoid giving their information to brands they don’t. 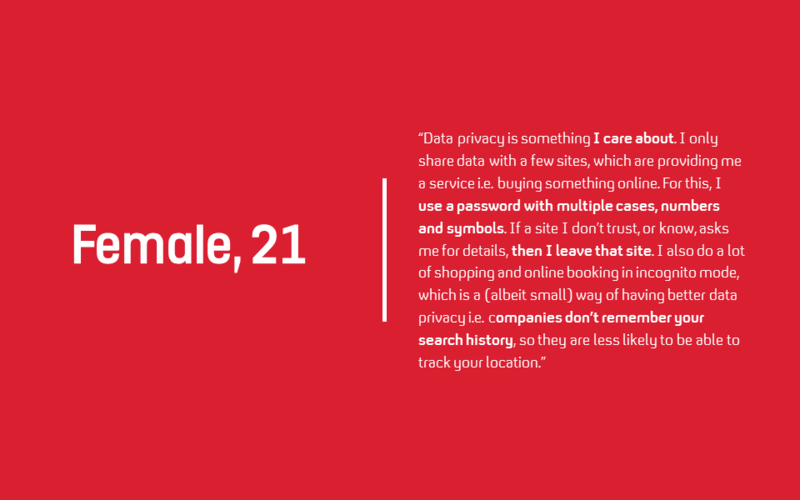 The community feel there is an ‘ethical line’ that brands must not cross when it comes to their personal data. 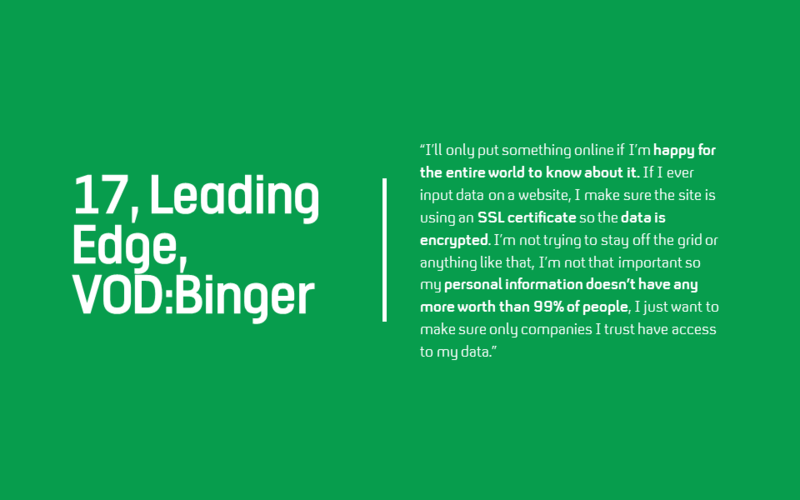 They want brands to be clear to them what data they are holding, and how they are using it. 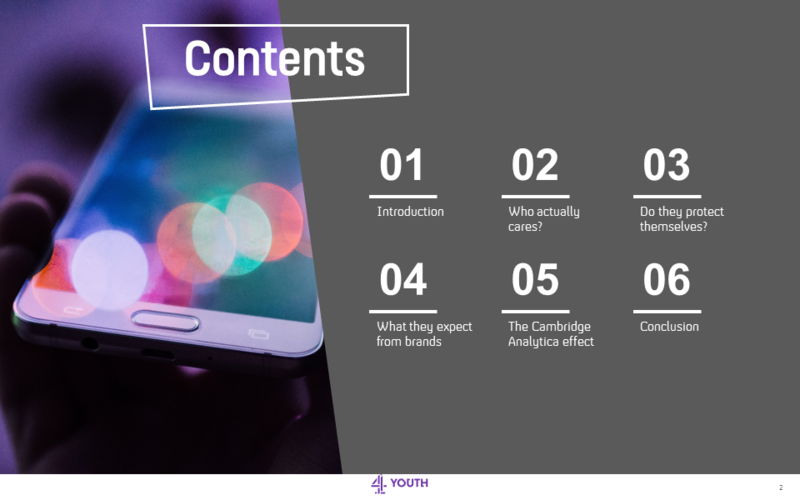 If a brand collects or uses their data ‘without them knowing’ for something that doesn’t benefit them as a consumer (selling their data to a third party to target, for example), they lose trust and may try and avoid it in the future. 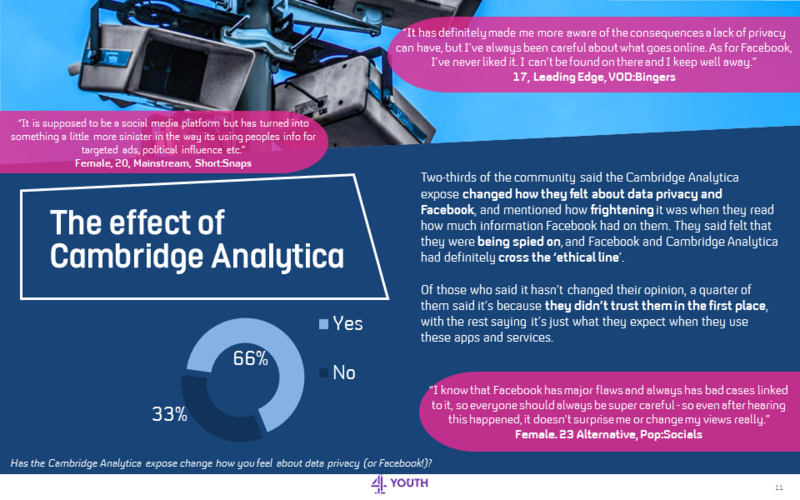 Two-thirds of the community said the Cambridge Analytica expose changed how they felt about data privacy and Facebook, and mentioned how frightening it was when they read how much information Facebook had on them. 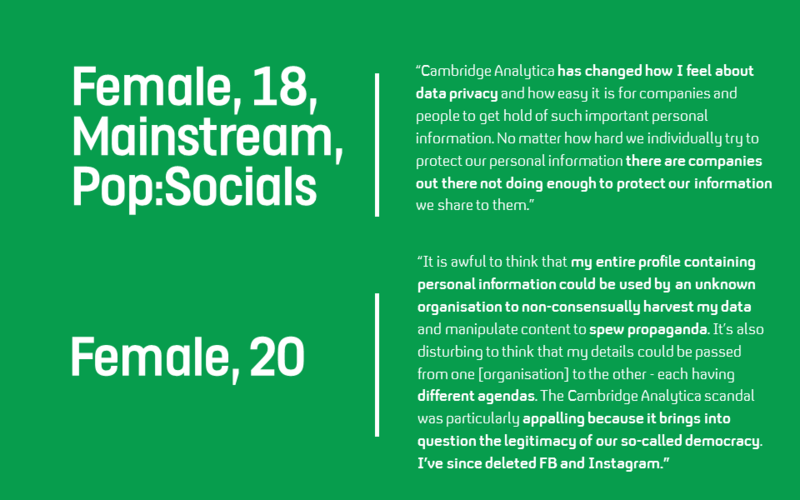 They said felt that they were being spied on, and Facebook and Cambridge Analytica had definitely cross the ‘ethical line’. Of those who said it hasn’t changed their opinion, a quarter of them said it’s because they didn’t trust them in the first place, with the rest saying it’s just what they expect when they use these apps and services. 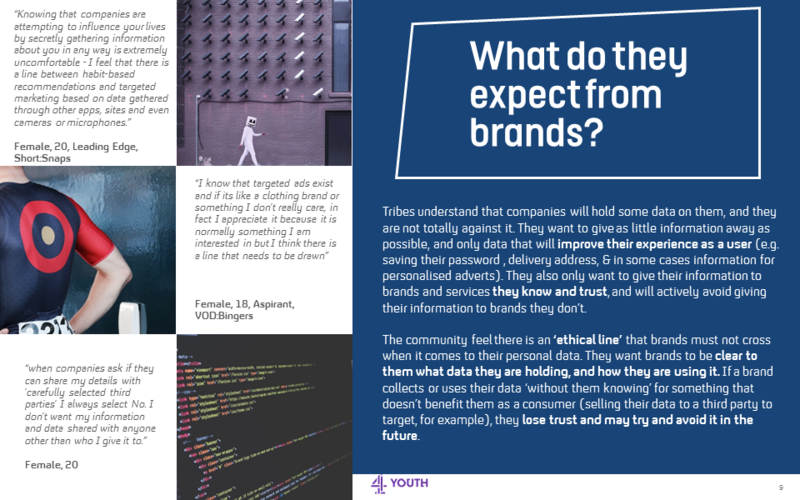 Overall, data privacy is a concern for the vast majority of our Tribes, they are fully aware with the type information that is held on them – particularly after the Cambridge Analytica expose – and worry about how it could be used. 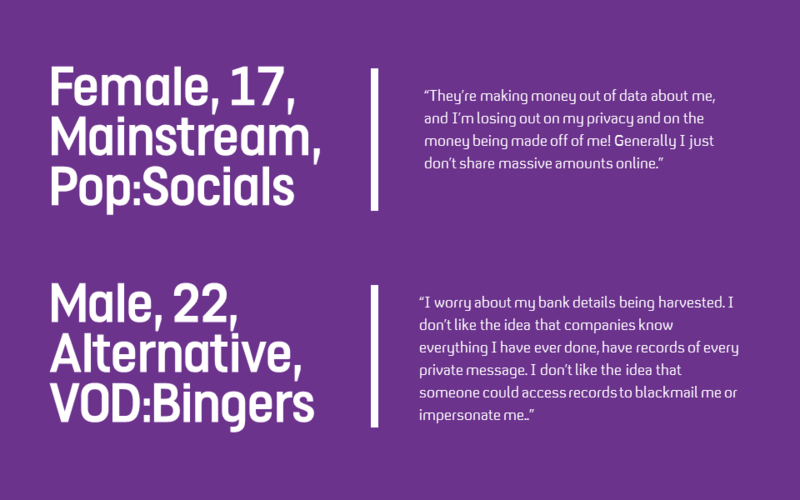 Despite altering their online behaviour to make sure they are protecting themselves as best they can, they understand that it is almost impossible to avoid giving their information away. Having said this, the Tribes aren’t totally against brands holding information on them, as long as they are clear with what they are holding, and use it in a way that benefits their experience as a consumer.